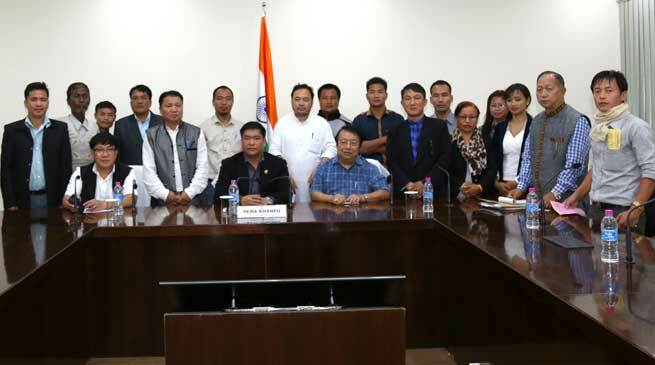 Chief Minister Pema Khandu today assured the Joint Working Committee of Arunachal Pradesh Trade Unions (JWCAPTU) to look into their 13-point charter of demands and to place the matter for discussion in the next cabinet meeting to be held in April. The assurance came after the JWS delegation consisting of its Chairman, Changma Tajo and Secretary General Kenkar Yomcha met the Chief Minister in his office and held an hour-long discussion on their demands. Stating that the state government is a welfare government, Khandu assured the visiting delegates that he is committed to providing best facilities to the working class community. He informed that since the demands of the working class involves various departments, Chief Secretary and Group of Secretaries has been asked to examine all the demands and to work out for its fulfilment. “Also all issues relating to your demands have been sent to respective departments,” Khandu told the labour delegates and assured that cabinet decision regarding their demands would be informed soon. Further in his appeal to the working community, the Chief Minister asked them to work for the welfare of the state and said that fulfilment of their demands could depend on resource generating capacity of the government. “We can work for the welfare of the all sections of people only when we have enough resources of our own,” said Khandu and informed that government is working to generate income from its untapped resources. He also appealed the JWC to give some time to state government to work on their demands, since in past 8 months the state had gone through several political upheavals. JWC in its representation thanked the Chief Minister for the opportunity to hear their grievances and expressing satisfaction with the assurances from state government decided to call off their state wide general strike temporarily. Labour & Employment Minister Kumar Waii, and Labour & Employment Secretary Kapa Kholie also attended the meeting.